Far out, man! In the 70's, even basketballs had groovy colors! Dunk is taking part in a Slam Dunk competition! Help him make it through all five levels: High school, College, Semi-Pro, Pro and All-Star. First, you build up speed for the big leap. Once you are ready, you take to the air. Press the keyboard buttons to do tricks to set up possible trick points. Hit keys in the correct sequence to do killer combos for more (possible) points. But keep an eye on the altitude meter and the time because the basket is coming up! If you're still performing a trick, you're not going to Slam Dunk and you're not going to get those points! Arrow keys- For the tricks. Wilt's helping out with laundry day by turning the chore into a game of basketball. Make as many hoops as possible by adjusting your angle and the power behind your shooting. 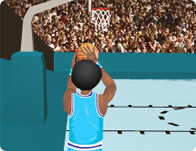 Score as many basket as you can and become the 3-point king. Show your shooting skills and as much basket as you can before the time runs out. Shoot the ball to all the baskets. You score more by making crazy hoopz! Shoot the red rubber balls through the moving hoops and score as many baskets as you can before time runs out. Ever played basketball with the undead! Funny game!